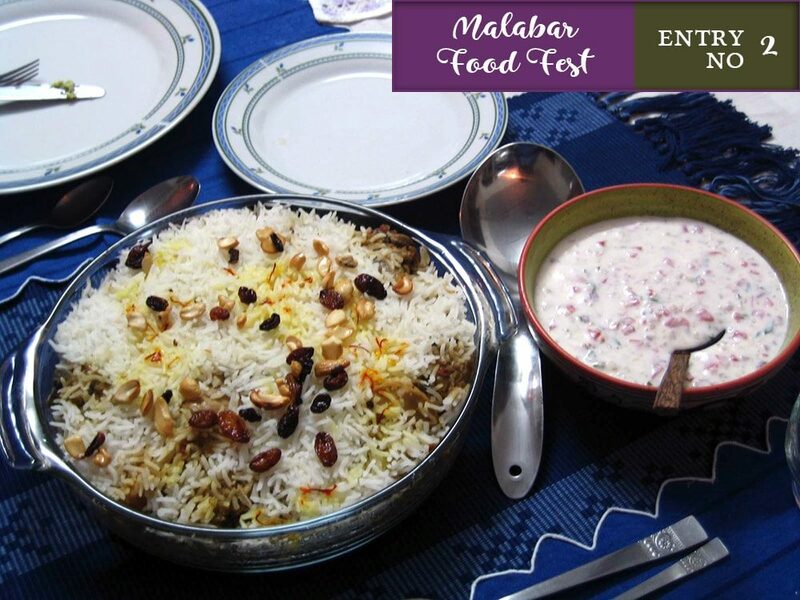 This is the second contestant entry we received for our “Malabar food fest 2018” organized to collect and share the traditional recipes of Malabar. If you haven’t submitted your recipe yet, please visit our food fest page to win an amazon gift voucher of 2,000INR. Moplahs are Muslims from North Kerala who trace their ancestral roots to Arabs who came Kerala centuries ago to trade in spices and silk; stayed on and married locals. The influence of Arab culture is evident in some of the malabar dishes and flavours. This is one of the biryanis that is prepared in the Moplah community. Clean and wash the chicken and drain off the excess water. In a large bottomed vessel, heat half of the oil and ghee, add sliced onions and fry till golden color and remove. Fry the cashew nuts and raisins and remove. Add the remaining onions and sauté till the onions become transparent. Add crushed ginger, garlic, green chilies and chopped tomatoes and continue sautéing for 10 minutes. Heat the remaining oil and ghee; add cardamom, cloves and cinnamon and sauté. Add washed, soaked rice and sauté. Add twice the quantity of boiling water and salt, cover with a lid and cook till the water is completely absorbed. Grease the bottom of a pot, spread a layer of cooked chicken, spread a layer of rice, sprinkle chopped coriander, fried onions, raisins and cashew nuts. Repeat the process; finally sprinkle the remaining cashew nuts and raisins. Cover the pot with a lid, seal the sides with flour dough. Keep on a very slow fire with live charcoal on top. Cook for 20 minutes. Remove and serve hot with salad. Tried this recipe or have any comments about this entry? Drop them below in the comments form. How to make Kallumakkaya Nirachathu /Stuffed,Steamed & fried Mussels? How to prepare North Malabar / Thalassery style Alsa / Aleesa / Harees? This entry was added on April 12th, 2018 by Renoos in Non Veg and tagged with malabar recipes, best biriyani recipe, thalassery biriyani recipe, kozhikkodan biriyani, kerala muslim biriyani, moplah cuisine recipes, malabar food fest, biriyani, malabar moplah recipes. Last revised on April 12th, 2018. This recipe was contributed by Kumari S as a contestant entry in our Cheenachatti Malabar Food Fest – Win Amazon Gift Vouchers event.